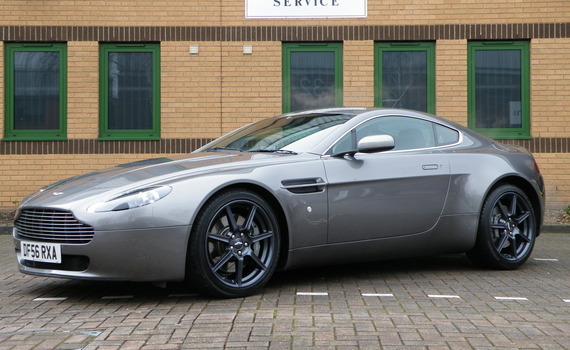 Using an enhanced version of the Aston Martin factory service schedule our maintenance programme on the new era V8 Vantage models will help ensure your vehicle is running to optimum performance and maintained to the highest standard. Our trained technicians will evaluate your specific service needs during an initial road test and vehicle diagnostic where it will be checked for stored codes. Once washed and weighted to the correct ride height the service programme will begin. All expenditure is agreed in advance and any faults found not rectified during the standard service for your vehicles age will be discussed and agreed before work commences. Pre-service Road Test. Renew engine oil and filter. Flush brake fluid. Renew air and pollen filters. Replace wiper blades. Clean throttle bodies. Quick Align check. Vehicle Inspection and Report. Check for stored codes and applicable software upgrades. Wash undertrays and wheels. Refurbish Hubs. Re-test and Final Check. Complimentary Autoglym service Valet. Pre-service Road Test. Renew engine oil and filter. Flush brake fluid. Renew air and pollen filters. Replace wiper blades. Renew transmission oil. Clean throttle bodies. Quick Align check. Vehicle Inspection and Report. Check for stored codes and applicable software upgrades. Wash undertrays and wheels. Refurbish Hubs. Re-test and Final Check. Complimentary Autoglym service Valet. Pre-service Road Test. Renew engine oil and filter. Flush brake fluid. Renew engine coolant, adding system conditioner. Quick Align check. Vehicle Inspection and Report. Check for stored codes and applicable software upgrades. Wash undertrays and wheels. Refurbish Hubs. Re-test and Final Check. Complimentary Autoglym service Valet. Pre-service Road Test. Renew engine oil and filter. Flush brake fluid. Replace spark plugs. Quick Align check. Vehicle Inspection and Report. Check for stored codes and applicable software upgrades. Wash undertrays and wheels. Refurbish Hubs. Re-test and Final Check. Complimentary Autoglym service Valet. Pre-service Road Test. Renew engine oil and filter. Flush brake fluid. Renew air and pollen filters. Renew wiper blades. Renew transmission oil. Clean throttle bodies. Quick Align check. Vehicle Inspection and Report. Check for stored codes and applicable software upgrades. Wash undertrays and wheels. Refurbish Hubs. Re-test and Final Check. Complimentary Autoglym service Valet. Pre-service Road Test. Renew engine oil and filter. Flush brake system. Renew air and pollen filters. Replace wiper blades. Renew engine coolant, adding system conditioner. Clean throttle bodies. Quick Align check. Vehicle Inspection and Report. Check for stored codes and applicable software upgrades. Wash undertrays and wheels. Refurbish Hubs. Re-test and Final Check. Complimentary Autoglym service Valet. At 4 year interval we recommend the air conditioning is serviced and the drier bottle replaced. At 5 year interval we recommend the engine accessory drive belt is replaced and the pulley condition advised.